It’s that time of year. Time for the pumpkins, pine cones and pretty fall leaves to make their presence known. But don’t you hate that fall seems to fly by? That those gorgeous autumn-inspired decorations are only on display for a few short months? Have no fear — seasonal home décor ideas that transition from fall to winter are here. Enjoy those decorations throughout the holiday season with these simple tips and tricks. When it comes to fall seasonal decorations, pumpkins have always taken the top spot. But these days, it’s more about variety than size. And by “variety,” we mean color and design. Yes, basic orange pumpkins will likely remain the most popular choice for the fall, but have you noticed that stores are now putting an emphasis on painted and shiny pumpkins? The gorgeous gourd relatives have gotten a major facelift, and with it, we’ve received a special decorative bonus: They can easily transition into winter holiday season decorations! Pumpkins that are white like snow? Covered in sparkly glitter, reminiscent of the magic of the holiday season? What’s not to love? 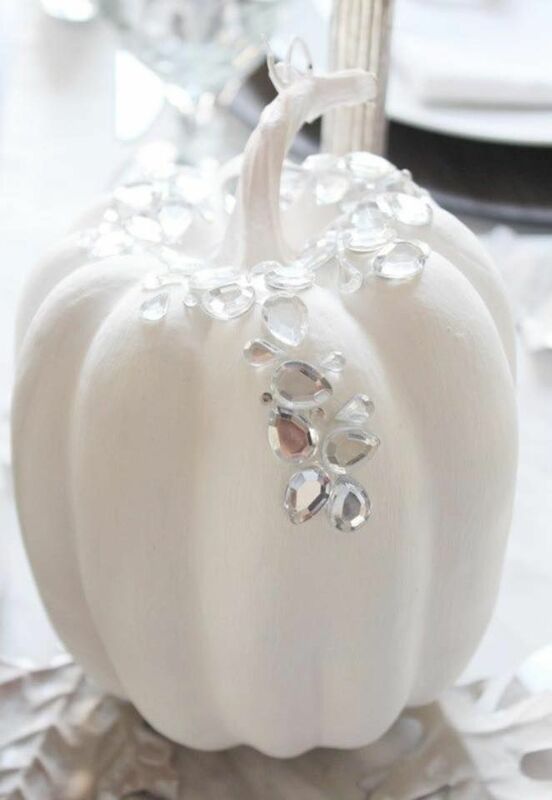 If you’re in the mood to save a little dough, feel free to go the DIY route: Simply paint your pumpkin décor white, create a pumpkin snowman, cover them in glitter, spray them with “looking glass” paint — the possibilities are endless. Bonus tip: If you get the kids involved in the process, it may quickly become a new holiday tradition. Want to know a brilliant holiday decoration hack? Just add lights. Easy peasy. Take this 5-minute topiary, for example. Made with elements found outdoors in the fall, it easily transitions to a holiday focal point with a simple strand of lights. This technique is especially effective for indoor fall decorations that highlight the outdoor elements, such as these elegant holiday pine cone vases. Got a minute? Then you probably have enough time to transition your beautiful porch lantern decorations from fall to winter. That’s right. By simply switching their “fillings” and adding a decorative bow or topper, you can change the look dramatically. Perhaps the greatest transition tip of all is to start with a piece that can simply be reversed when the season changes. Pumpkin stack on the front, snowman on the back. Thanksgiving message on the front, Christmas message on the back. It really doesn’t get any easier than that! For more fall and winter decoration ideas, check out these five fall fireplace inspirations and easy DIY Christmas decorations you can do with your children. Happy Holidays!